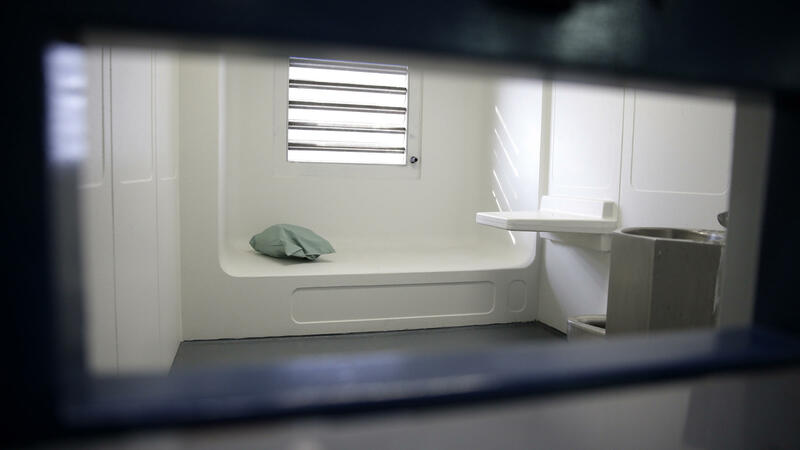 A cell at New York's Rikers Island jail. About 1,000 people die in American jails every year, and about a third of those are suicides. If it turns out Bland did commit suicide, experts in jail mortality say it wouldn't be as surprising as her family believes. The grim reality is that jails have high suicide rates — higher than prisons. Part of the reason, says corrections expert and consultant Steve J. Martin, is what he calls the "shock of confinement." Jails often house people who've never been in serious legal trouble before, and it can have a traumatic effect on them. "It overtakes your being in the sense that normalcy is gone," Martin says. Martin has worked in corrections for decades, and he's the court-appointed monitor for New York's reform effort at Rikers Island. He says jail can be especially traumatic for someone who's usually a straight arrow. He imagines what would be running through the mind of his daughter, a high-achieving college student, if she were locked up.
" 'Oh my heavens. My life is going to end right now with this experience. Everything I've worked for, the way people view me, the way my parents view me' — all that stuff is suddenly and dramatically in jeopardy," he says. About 1,000 people die in American jails every year and about a third of those are suicides. Martin says prison administrators have the advantage of getting detailed information about the inmates they receive. But jails do not. "When you come right off the street, there is a world of difference in the risk of harm that relates to that person about whom you literally know little or nothing," he says. So jails screen new arrivals for depression; it's often a questionnaire, the kind that was administered to Sandra Bland twice in Waller County. But even when mental illness is obvious, jailers sometimes seem dangerously indifferent. This spring, Fred Farris' son, Keaton, was in a jail in Island County, Wash.
"They were fully aware of his mental situation," Farris says. Keaton was bipolar and acting out. At one point he stuffed his pillow into the toilet. So the jailers turned off the water to his cell and kept their distance, and they apparently missed the fact that he was starving himself and dying of dehydration. He died alone in his cell, and his father can't understand how it happened. "Are they trained to deal directly with somebody that reaches a state of psychosis? You would like to think they are," he says. And in fact, horror stories aside, American jails have become better at handling mental illness. A generation ago, the suicide rate was a lot higher. "If you went into Waller County jail 20 years ago, they wouldn't have any intake screening. They might ask about 'Do you have any medical issues right now?' and that would be about it. They never would have asked any questions about suicide or mental illness and such," says Lindsay Hayes with the National Center on Institutions and Alternatives. He has spent his career on this issue. Mental health screening is a given these days, even in tiny jails. But he says jailers can't rely just on those questionnaires. Too often, when a new inmate answers the question about feeling suicidal with a "No," Hayes says the jailers figure they can stop paying attention to his mental health. "Simply because someone answers 'No' right now doesn't mean in the next five minutes, if they don't get through to their loved one or if their loved one doesn't come out and bail them out, that answer might change. And if you ask me that again 15 minutes after my phone call, I might become suicidal," he says. Even though the suicide rate inside jails has improved a lot, he says people should still keep in mind that it's still three times worse than on the outside. Prosecutors in Waller County, Texas, say they're bringing in a committee of outside lawyers to help investigate the death of Sandra Bland. Her death in a jail cell has raised a nationwide controversy. A medical examiner determined she hanged herself with a trash bag, but her family says she wasn't suicidal, that she was looking forward to a new job. Waller County will put the question of Bland's death before a grand jury next month. NPR's Martin Kaste reports that the case is bringing attention to a dark reality about jails and people's tendency to harm themselves when they're locked up. MARTIN KASTE, BYLINE: In this story, we're talking about jails, not prisons. Jails are the local lockups where people serve short sentences or wait for their trials. And the leading cause of death in jails is suicide. Steve J. Martin blames what he calls the shock of confinement. STEVE J. MARTIN: It overtakes your being in a sense that normalcy is gone. KASTE: Martin has worked in corrections for decades, and he's the court-appointed monitor for New York's reform effort at Rikers Island. He says jail can be especially traumatic for someone who's usually a straight arrow. He imagines what would be running through the mind of his daughter, a high-achieving college student, if she were locked up. MARTIN: Oh, my heavens. My life is going to end right now with this experience. Everything I've worked for, everything - the way people view me, the way my parents view me - all that stuff is suddenly and dramatically in jeopardy. KASTE: About a thousand people die in American jails every year and about a third of those are suicides. Martin says prisons have the advantage of getting detailed information about the inmates they receive, but jails do not. MARTIN: When you come right off the street, there is a world of difference in the risk of harm that relates to that person about whom you literally know little or nothing. KASTE: So jails screen their new arrivals for depression. It's often a questionnaire, the kind that was administered to Sandra Bland twice in Waller County. But even when mental illness is obvious, jailers sometime seem dangerously indifferent. FRED FARRIS: And they were fully aware of his mental situation. KASTE: That's Fred Farris, talking about what happened to his son this spring in a jail in Island County, Wash. Keaton Farris was bipolar and acting out. At one point, he stuffed his pillow into the toilet. So the jailers turned off the water to his cell and kept their distance, and they apparently missed the fact that he was starving himself and dying of dehydration. He died alone in his cell, and his father can't understand how it happened. FARRIS: Are they trained to deal directly with somebody that reaches a state of psychosis? You would like to think they are. KASTE: And in fact, horror stories aside, American jails have become better at handling mental illness. A generation ago, the suicide rate was a lot higher. Lindsay Hayes is with the National Center on Institutions and Alternatives, and he's spent his career on this issue. LINDSAY HAYES: If you went into Waller County jail 20 years ago, they wouldn't have any intake screening. They might ask about - do you have any medical issues right now? And that would be about it. They never would've asked any questions about suicide or mental illness and such. KASTE: Mental health screening is a given these days, even in tiny jails. But Hayes says jailers can't rely just on those questionnaires. Too often when a new inmate answers the question about feeling suicidal with a no, Hayes says the jailers figure they can stop paying attention to his mental health. HAYES: Simply because someone answers no right now doesn't mean that in the next five minutes, if they don't get through to their loved one or their loved one doesn't come out and bail them out, that answer might change. And if you ask me that again in 15 minutes after my phone call, I might become suicidal. KASTE: And even though the suicide rate inside jails has improved a lot, he says it's still three times worse than it is on the outside. Martin Kaste, NPR News. Transcript provided by NPR, Copyright NPR.